Working in youth ministries, my heart squeezes with sorrow and fills with compassion as I see all of the things our youth face today. They are surrounded by the world’s standards and expectations, and put into highly stressful situations. I try to encourage the young ladies in our youth group, but there is only so much I can do because of their busy schedules and limited time. ADORED: 365 Devotions for Young Women is a quick devotional which provides sound biblical doctrine, and is relatable to today’s young women. Geared toward teen girls, it emphasizes how they can strengthen their relationship with God through reading and studying God’s Word. It also shows them how they are adored daughters of God, how important and valued they are. The author illustrates to the reader that God made them with special gifts and talents and how they can contribute to the heavenly kingdom. The devotional speaks in a gentle and conversational manner without being preachy. It challenges the reader to think about what it means to be a child of God and to be adored and loved by Him. It encourages young women to make wise, godly choices. Topics include modesty, self-esteem, idols, serving in the church, being yourself and not following the crowd, working hard, following through with commitments, friendship with the world and many more. I was so excited that it touched on so many problems and issues our teens go through. I would have loved to have read this devotional when I was their age, but I enjoyed reading it as an adult and learned some things myself. Each daily devotional takes about a minute to read. Beginning with a verse, it leads into the subject which is covered in a few paragraphs. The author makes a statement or asks a question, gives the reader the biblical answer, and then shows them how to apply it to their lives. It also includes space for journaling and has many Scripture references. The cover art and page edging is charming and attractive with a blue and gold design. 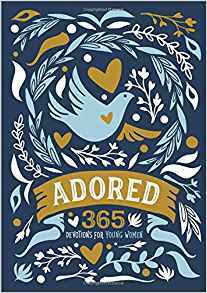 Adored: 365 Devotions for Young Women would make a lovely gift for the teen girl or even the college-age young woman in your life. It is written by Lindsay A. Franklin and published by Zondervan (2017). J. D. Rempel, https://jdrempel.com/ , is a graduate of Simpson College. She is endeavoring to pen a YA science fiction novel and an adult fantasy series. Currently, she is seeking a publisher for her middle grade fiction novel. J. D. loves to read, work with her husband in youth ministry, and play peekaboo with her turtle, Applesauce.